There are lots of baby monitors in the market, but not all of them are created the same. Many would say that they’re the best, but of course, you wouldn’t know that unless you’ve tried them out—or at least, until you’ve seen a review. People get baby monitors to check on the state of their child. Realistically speaking, no one can really stay with a baby 24/7 because there are still other things to do at home. However, a parent really wouldn’t be able to get peace of mind without knowing if his baby is okay—and that’s where a baby monitor comes in. Stability. You have to know whether the product has good market standing, if people are saying good things about it, and if it could actually withstand the test of time. Special Features. Again, baby monitors are never equal—if they were, there wouldn’t be a need for this list. Anyway, you have to choose a baby monitor with the best features you can find (such as voice-operated systems, night vision capacities, transmission value, video saving and sharing, etc.) so you’d know that you’re able to give your child the best kind of care! Safety and Security. These are the main goals you should have in mind in looking for a baby monitor. You have to make sure that the device keeps your baby safe, and that you do get a sense of peace and security even if you’re not beside your child. What about price, you may ask? Well, incidentally, that comes into play, but you don’t have to make it your top priority. Something may cost much, but if it’s of extremely good quality, why not, right? Again, baby’s safety always has to be a priority. When it comes to being the best and most innovative, those made by Samsung are some of the most sought after baby monitors in the market right now. In fact, there are a number of types and that’s why it’s important to read Samsung baby monitor reviews just to make sure of their quality, and what it is that they can really do. Two-Way Talk and Quiet Mode System. One of the best things about this is the fact that there’s a Samsung video baby monitor Vox option that you can tweak. By doing so, you get to reduce ambient sounds and frequencies in the room so you’d be able to get the most accurate recordings of what’s going on in your baby’s room! SAFEView Settings. With this feature, you can be sure that you’d get to monitor the room—100 degrees up and down, and 300 degrees left and right, which would be able to tell you whether your baby is sleeping soundly or not! Remote Night Light and Night Vision. Now, you’d also be able to monitor your baby while in low-light settings, and while you’re away from the room with the help of the Samsung baby monitor app. The device also adjusts the image, based on the light, so you could get a clear view of the situation in the room! If this doesn’t work for you, you could try the Samsung video baby monitor 3037w instead, which is an upgraded version of the said device. Next up is the Samsung baby monitor SEW 3036. When it comes to Samsung baby monitor out of range features, this one is number 1, especially because it dubs itself as a wireless baby monitor. Built-in mic/Two Way Talk System. This way, you can “talk” to your baby even while you’re not in the same room as he is in. As they say, bonding starts when you begin to talk to your child even at an early age. Since you’re probably also a busy person, it’s nice to know that you’d be able to bond with your child with the help of this device. Background noise could also be put down when you turn on Quiet Mode. Pure Digital Signals. This means that you’d get some of the clearest video output you could expect. But then again, you have to keep in mind that since video is in VGA output, it might still not be as clear as HD—but you could still give it a try. 3.5 High Quality Color. However, even if the output is in VGA, you could expect high-quality full color display instead, based on its 2.4 GHZ Signal! And then there’s Samsung video baby monitor 3034wn. Basically, it has all the same features as the other Samsung Baby Monitors mentioned above, but the thing with it is that it’s the most easily accessorized of them all. Additional Night Vision Camera. This uses 640 x 480 pixels, and works under 2,400 to 2,430 frequency ranges, with 100m of transmitting distance. Upbright Adapters. As the name suggests, these could make the video output brighter, but you’d have to plug the monitor while using it—which might make it hard for it to do its pan and tilt job. T-Power Long Cable. This could be used both as a charger, and also as means to let the baby Monitor be able to zoom more into the room. While these add-ons are pretty good and reliable, they might also seem to be a hassle because without them, what would the original baby monitor be like? It’s not wrong to have all these add-ons, but then again, people these days often like it when they have something that’s uncomplicated—and could make their life more manageable without asking them to do a lot. This means that you might have to do some Samsung Video Baby Monitor pairing, or have to use this device with other Samsung products. But, if this is fine with you, then it’s okay, too. Last on the top of the list is the Samsung baby monitor 3035 Secure View Baby Monitoring System. Sleek and Compact Unit. It’s actually one of the smallest Samsung devices out there, as it could fit right in the palm of your hand—which makes it quite portable. You could also playback videos while holding the device and you could also hook it up to your TV so you could playback photos and videos from your child’s bedroom in it! Just don’t forget to read the Samsung video baby monitor manual so you’d be able to know what to do. Easy Video Sharing. This device also makes video sharing easy through MSN or Skype. This way, your relatives and friends abroad would be able to see how your child is. This works best for parents who have to work in separate countries. At least then, some form of bonding would be around! Also, you do not have to worry about strangers getting access to those videos, because everything is secured, and it’ll just be done on a private basis. Night Vision and Digital Zoom. Of course, when there’s night vision and digital zoom options, you can be sure that you’ll be able to get accurate recordings of what’s happening to your child while he’s alone in his room. This device also has temperature sensors that are effective in taking care of a baby. The best part is that batteries don’t dry up fast—so you could expect the device to work with the best of its abilities without the need to change batteries over and over again. It definitely exceeds everyone’s expectations. While these are some of the best products you can get, take note that you do have to read the manual to check for Samsung baby monitor troubleshooting, just to be sure that you’re setting things and fixing them up right. Always check the back of the box for warranty and Samsung baby monitor customer service details. Warranty usually lasts for a year or two, but it always depends on the product, even if they’re made by the same manufacturer—so it’s always best to be sure. As for Samsung baby monitor replacement issues, there are no specifications on Amazon, so it’s best to check the box or the manual—or call a customer service representative to get some answers. As mentioned earlier, not all baby monitors were created the same. When it comes to Samsung Monitors, there are those that are commercialized as video baby monitors—meaning they have impeccable photo/video capturing systems, high resolution outputs, and just about everything you could ever want in a baby monitor. Video Clarity. This has to be number 1. Why would you even buy a video monitor if you can’t make out the images coming out of it, anyway? VGA is okay, but HD is always better. Night Vision Camera. One of the main uses of a baby monitor is to check on your baby at uncanny times of the day—specifically at night. That’s why you need a monitor with a proper night vision camera that will really allow you to see what’s going on in your child’s room—in a clear and precise manner. Video and Sound Compatibility. It would also be nice if you’d have a monitor that combines sounds with video—so that the reports you’d get would be more realistic, and you’d really know what’s going on. Number of Cameras Supported. When a video monitor supports more than 1 camera, it means that you’d have more chances of knowing how your baby is doing. Incidentally, you could use it for the other rooms in the house, too, so in case you have more than one child, you’d know how each of them are. Length of Transmission. And of course, it’s good to have a device that allows for long transmission—as in 800 to 900 feet and even more, so you’d have no problems checking up on your child wherever you may be. So, which one of the video monitors in the market should you try? Here are a few suggestions. The camera’s tilt and pan capabilities will allow the user to control the focus of the camera from the remote handheld device. This system also features eight LED lights that operate at 940 NM, which provides soft illumination that won’t disturb your infant in the dark. This system offers a range up to 900 feet so you will be able to use this device for monitoring when you’re on the move. You can purchase up to four cameras to be used with the same handheld device and you’ll be able to scroll from camera to camera, which makes it ideal for larger families. The 2X digital zoom can be adjusted using the control panel on the handheld device. This system features simple controls that direct the camera to tilt up or down, zoom in or pan out. 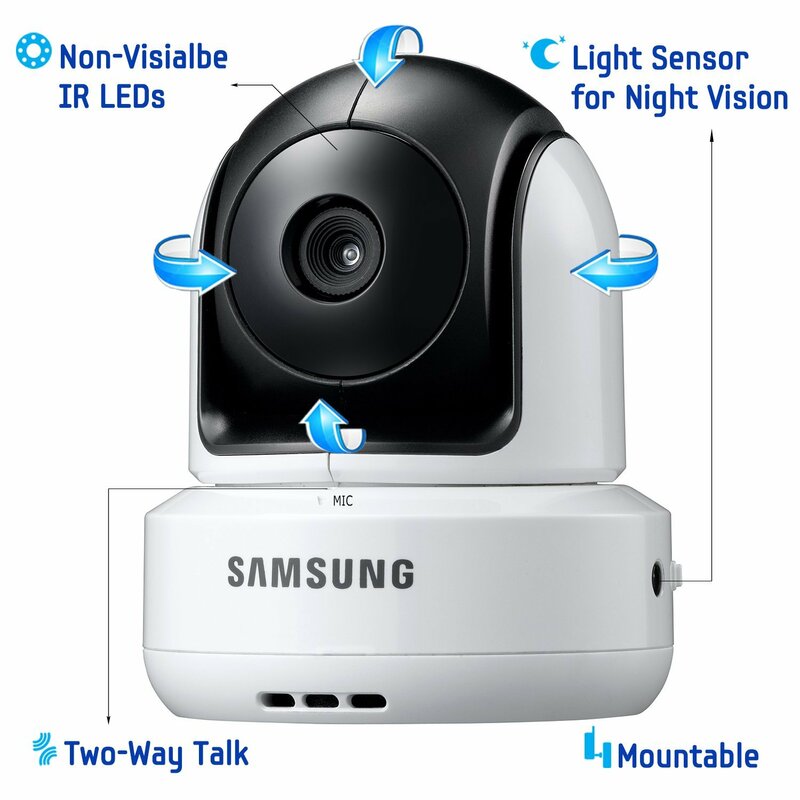 In your baby’s room Samsung allows you to point the camera around the room to see if your baby really is sleeping and to monitor all activity. The night vision feature means that you will be able to see up to fifteen feet using the invisible infrared lights, so you can keep tabs on your child in low light conditions. The camera sensors will detect the light levels and adjust the image for optimal viewing. During the night, if it’s too dark the handheld device can be used to activate the soft and soothing night light, which emits a light glow. The digital signal utilizes 2.4GHZ frequency in order to provide interference free and secure video. Unlike most other devices on the market, the signal emitted from this device will not be interrupted by other baby monitors in the area, microwaves, cordless phones, smart phones or wireless routers. This monitor goes beyond just listening. The built-in microphone will allow you to speak or sing to your infant, even while you’re still in bed. The voice activated quiet mode will reduce white ambient noise that comes through the monitor. You can adjust the sound sensitivity level in order to be alerted to only louder sounds. However, this model can also be adjusted to detect even the smallest sounds. Consumers gave this model a four out of five star rating, for pricing, ease of use, night vision capability and standout features. Currently this model is priced at $249. Remote Night Light. Some babies couldn’t sleep with full lights on, but then again you also have to make sure that some light is left in the room for easy monitoring purposes. With the remote night light option, you get to cast a dim and calming nightlight in the room—definitely perfect for your baby! Expandable System. This means you get a panoramic view of the room without having to change batteries from time to time, because internal and external power sources are different. More so, there are available scan and zoom modes, and you’ll be able to make use of these easily because interface is really easy to understand. Set your camera at pre-set or continual intervals, as well—and you can also monitor up to 3 available cameras, too! Sound Level LEDs. Not only will you be able to monitor your child by means of videos, you’d also be able to hear even the softest sounds they’ll make because of this device’s Sound Level LED system. It doesn’t matter whether the room is noisy or not—you’d still be able to hear how your baby is. Power Saving Ability! And, you can prolong battery life by means of turning off the monitor—take note that the device would still be able to detect sounds even after you do this. And then there’s the Samsung SEW-3040 simple view baby monitoring system, which is marketed as parents’ best friend when it comes to infant care. With an ultra-large 4.3” LCD Monitor, it will be extremely easy for you to check on your baby, and see what’s happening in his room. Secure Interference. This means that no one else will be able to see the state of your baby but you. This is essential in order for you and your baby to feel safe, not to mention it comes with pure digital signals, too—which means that you do not have to hook it up to anything else just for it to do its job. Invisible IR LEDs. With Infrared LEDs, you can be sure that your baby will be able to sleep well because he wouldn’t get disturbed by any lights or noises. You could also put the device on sleep mode so it could drown out the ambient sounds in the room, and let you see just how your baby is doing, or if he’s making any noises. 800 feet transmission. Even if you’re 800 feet away from your child, it would still be easy for you to know what’s going on—without the need for wires and such. You see, this is such a big leap from having to use wires and routers just to make sure that you’re still able to get signals while away from a room. Now, even if you’re doing something else, you wouldn’t have to deal with stepping on wires and the like. Supports up to 4 cameras! And, the best part is that this device supports up to 4 cameras—which means it would be easy for you to get panoramic and real-time results of how your baby’s doing! So, basically this is one of the best baby monitors you can get in the market! It’s definitely worth trying out. If you could recall, it was earlier discussed that the Samsung SEW-3037 video monitoring system is really one of the best that you can get in the market. Well, you could also say that as a Baby Video Monitor alone, it could really put its contemporaries to shame. Built-in belt clip. You can take this with you anywhere while the device is in your kid’s room. It makes for easy monitoring purposes, without the need for any apps and such. Sure, it’s a bit old-school, but hey, it actually works. Sound Level Indicators. Apart from high quality images, it’s always good when a parent hears sounds coming from his child’s room—just to give him some peace of mind. Basically, you’d get it from this device. Out of Range Alert. You’d also get alerts when you’re a bit too far away from your child, and when something unusual is going on. It’s a good way of checking up on your child, and arranging security details, if necessary. VOX (Voice Operated Switch). Finally, since as a parent, you’d probably have your hands full more often than not, so it’s nice when you get a device that allows you to control it just by using your own voice. Next, there’s the Samsung SEW-3036 baby view baby monitoring system, mostly known for its Infrared Night Vision System. What’s great about it is that night vision works for up to 15 feet—so in case your baby gets out of the crib, or someone is around the room, you’d easily see it. Monitor LEDs. This will send you not only some of the clearest images, but also five different sound levels that would help you monitor your baby more. Interference-free Signals. You know what this means? Well, it’s that even if there’s a storm coming, even if there are other kids playing in your child’s room, you’d be able to check on him well! 4 Camera Capacities. This device could also monitor up to 4 cameras—which is definitely something helpful! Two way talk. This feature of the Samsung SEW-3035 secure view baby video monitor allows you to talk to your child even if you’re not together in the same room. This way, you could soothe or calm him down with your voice! 4 camera capacity. Again, this is a big plus—4 is better than 1, especially when safety is concerned! Full color videos. Colored videos are definitely better than black and white ones in the sense that they’re more realistic—and the images definitely won’t get blurry! This device also allows you to share videos via Skype, but don’t worry because your privacy would still be protected. You just have to tweak some settings and you’re all set! If you could recall, the SEW-3034 is the device that needs a couple of add-ons to make it better. However, when it comes to its video monitoring capacities, no one can deny that it could put some of its contemporaries to shame. Easily Mounted Camera. This device has superb balance which makes it easy for you to place it on the bed, on tables, or just mount it wherever possible. This way, you’d have no problems looking for something that would make the camera stand and such. Auto Activated Night Lights. In case you want to make sure that some lights are left in your baby’s room even if you’re not there, it would be nice to set up the auto-activated night lights option of this device. Long-lasting battery. In many cases, the batteries prove to be a problem because it’s not good to see a device running out of juice more often than possible. Well, that wouldn’t be a problem with this device. While this monitor has a clear camera, there aren’t many special features—so you do have to think twice before you decide to buy this. Safety Warnings. These would tell you whether camera is extremely out of range so you can fix it right away. Precise Video Quality. This is due to the help of Samsung’s new video mechanisms that allow for high-definition videos without any hassle! Exceptional Sound Clarity. As mentioned, this is more than just video camera—you’d also be treated to great sound quality, which will make it easy for you to understand if your child is in trouble or not. Safe to say, this device has a lot of promise. However, not a lot of people could attest to its quality, so you might have to check for yourself. Some reviews are exceptional, though, and if that’s enough for you, then that’s alright, too. 350 feet transmission range. This may not be as far as its contemporaries, but you could expect a clearer type of video transmission in return. Interference Elimination. This means that anything that might obstruct signals would be disrupted by the device itself—so that you’d be able to see what’s going on with your child in real time! Built-in music player. There are 4 different tunes that you could play in place of lullabies for your child. This way, it would be easier for him to go to sleep, and you could also silence the ambient sounds in the room, so you’d really be able to monitor your baby better. Two-way audio communication. And of course, this device also allows you to take care of your baby better by getting the chance to talk to him via the device itself. There’s a catch, though: Most reviews for the SEW-3020 show that there are problems with the night-vision camera options. That’s not really a good thing because it means you may have to get another baby monitor just for night vision purposes—and that would definitely be a hassle. However, there are still some reviews that say that the night vision camera is okay. It may not be as clear as others in the market, but it’s still pretty reliable, according to them. So, you just might have to try it for yourself. 4 Camera Capacities. This device allows you to monitor up to 4 cameras at home—which makes it easier for you to check on your child, and other people in the house, too. 350 feet transmission. Again, it’s not that far, but people who’ve tried the device say that it works, mainly because the signals are pretty clear—so you can do whatever it is that you have to do without worrying about your baby! State-of-the-art audio and video quality. Like its predecessors, this device uses Samsung’s state-of-the-art mechanisms in producing audio and video that would make you feel like you’re just in the room with your child! Another great thing about this device is the fact that it’s so handy—it actually fits right in your palm! Aside from that, there are no other big special features, but when it comes to stability, this device definitely wins—and most reviewers think so, too! Remember, when it comes to video baby monitors, you have to make sure that you choose one with exceptional video quality. This way, it would really be easy for you to check up on your baby even if you’re not in the same room as he is in. And finally, you should also think of getting some audio baby monitors. While it’s good to see how your child is doing by means of a video, it’s also good to check sounds coming from his room because you never really know if something is happening until you hear it. It’s not about scaring yourself, you know? It’s about being sure that your child is doing fine. Sometimes, seeing isn’t enough—you have to hear what’s going on, too. You have to understand what’s happening in a 360-degree manner. High quality of sound. It doesn’t have to be extremely loud, but it definitely has to be audible. If you have read some of the reviews earlier, you might have noticed that some of the monitors featured have precise audio quality—so try to look for devices like that. Length of Transmission. Again, this is important not only for videos, but also for audio. Your audio monitor wouldn’t matter if you won’t be able to hear what’s going on. Remember that a monitor has to be reliable even if you’re hundreds of feet away from the room. Otherwise, what’s the point? Other Features. Of course, it’s not just all about the sounds. You have to check for the other features of the device, too. Make sure that they’re unique—and that you’d definitely get your money’s worth! First on the list is Samsung SEW-2001W digital wireless audio monitor. Dubbed as an extra set of ears, it’s basically perfect for trying to hear what’s going on in your baby’s room with just the push of a button. Basically, it’s easy to monitor your baby because the device stays quiet until noise is detected in the room. What’s more is that the device doesn’t make any sounds of its own—so your child would be able to sleep well, and wouldn’t be disturbed. You can also easily bring the device with you anywhere, with its belt-clip button. 1.8 GHZ Dect Digital Technology. In layman’s terms, this means that sound quality is really high, and of extraordinary quality. More so, this type of technology provides you with interference free signals—so no matter what happens, you can be sure that monitoring would be continuous. 900 ft. transmission range. Now, this is the kind of transmission range that you’d want. With 900 feet of transmission range, you can be sure that it would be easy for you to hear whatever it is that’s going on in your baby’s room, without feeling the need to stay close—or not do what you have to do! Sound Alerts. You’d be notified when something unusual is going on—so you can check the room right away! Battery life is long, too! Simple and fuss-free mechanism. Best of all, it’s so easy to operate the Samsung SEW-200 Digital Wireless Audio Monitor. Pairing with the parental unit is easy, and it’s extremely portable, too! As you can see, this one really has lots of great features and that’s why it’s an early favorite of many! If you can get hold of this, baby monitoring would be easy. However, don’t expect to see any videos whatsoever as this a purely audio type of monitor. If that’s what you need, then this is extremely good for you! The Samsung SEW-2002W secured digital wireless audio monitor is the latest in the SEW audio monitor series from the said brand. Just like its predecessor, it offers the clearest form of audio monitoring services available without much of a hassle for the user! Crystal Clear Sounds. You’d feel like your baby is just right next to you—and that’s exactly the kind of sounds that you want to hear from your audio monitor. Interference Free Connection. Just like the SEW-2001, you could expect that transmission signals won’t be disrupted with this device. Even if you’re 800 to 900 feet away, you’d still be able to know what’s happening in your baby’s room—which will definitely give you some peace of mind. Decorative Purposes. This device actually looks pretty nice; it wouldn’t ruin the aesthetics in your home. In fact, you can easily place it on tabletops and it won’t make things look bad. So, you don’t actually have to bring it with you everywhere—but you can, because of belt clip-in mechanisms of the device! Security is ensured. With 1.8 GHZ of power, you can be sure that your baby will be in safe hands—and that monitoring would be a breeze! Again, this has no video options, but if you’re just looking for an audio monitor, this one is definitely perfect—and even better than its predecessor! Make sure that it fits the purpose that you have in mind. If you want an audio monitor, go for it. If you want something with amazing video clarity, look for video monitors. The important thing is you get something that would answer to your needs. Read Reviews and Product Comparisons. They always help. It’s good to hear what people who have tried these devices have to say, so you’d know whether they’re worth trying out or not. And, make sure you get your money’s worth. It doesn’t matter if you have to shelve out a lot of cash, as long as you know that the product is actually reliable. If not, look for warranties, or try to ask for replacements. Remember you need only the products that are worth your money—and would really help you out in life. Keep these tips in mind and you’d surely find the best baby monitor out there! Good Luck!